TekSynap was instrumental in our partnership and proposal support to the successful capture of the National VA WiFi program at the US Department of Veteran Affairs. Harris formally recognized our contributions in September of 2013 and again in November of 2014. The combined value of the VA WiFi National Program effort inclusive of Groups 1-3 is valued at $180M. On February 5th, 2009, General Dynamics IT Civilian Homeland Security Division awarded a contract to us to provide assistance with rapid deployment of a VA Wireless Fidelity (WiFi) location-based infrastructure across the nation. The wireless location-based infrastructure will be installed at facilities across the US, Alaska, Hawaii, Philippines, and Puerto Rico. 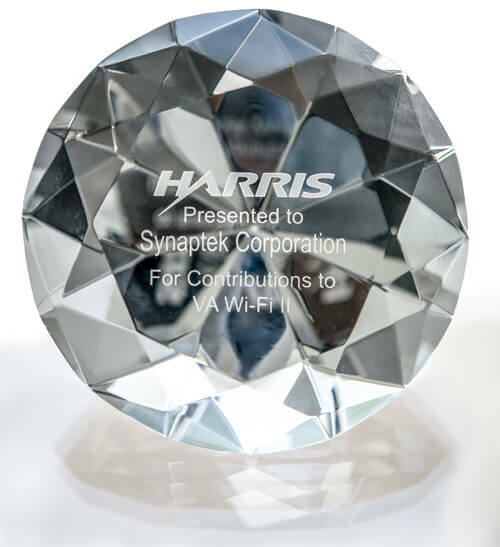 As the solutions Architect and central engineering we will work in collaboration with Harris Corporation, AMSG, and Cisco Systems to implement and service the new VA Wireless Network nationwide. The VA WiFi location-based infrastructure offers the VA secure, wireless communications for a broad range of data and telecommunications needs including video, voice, and data. The solution will be installed at over 331 Veteran Offices nationwide.